Not a fan of Disney sequels. Well, nobody is. I was hoping this one would at least be tolerable but they actually went down the same route that "Cinderella II: Dreams Come True" did. That was already considered one of the worst Disney sequels ever made and they ripped it off! 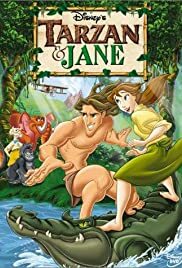 This film has no flowing narrative but instead features three short stories talking about other things that happened to Tarzan and Jane. If you're going to make a sequel, at least have it advance the story in some way. I mean, I believe there was a Tarzan TV show based on the movie made at this time.